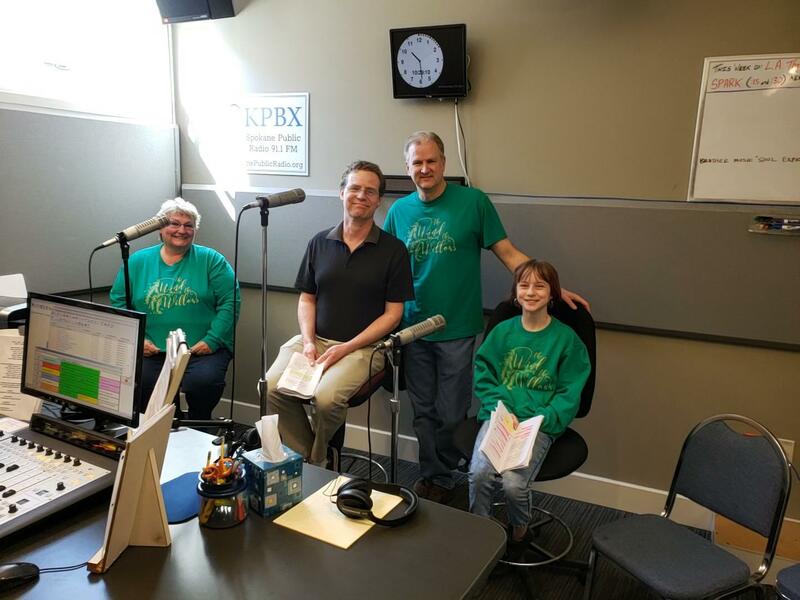 From the Studio: Spokane Children's Theatre presents "The Wind in the Willows"
Interview with Spokane Children's Theatre. (from left) JoAnne Emery, Craig Hirt, Doug Beschta and Ellie Weitz in the KPBX studio. Director JoAnne Emery and Spokane Children’s Theatre Managing Director Doug Beschta brought along actors Craig Hertz and Ellie Weitz to talk with us about their upcoming production, “The Wind in the Willows.” Based on the classic 1908 novel, it follows an anthropomorphized mole, badger, and water rat in their endeavor to save their impulsive friend, Mr. Toad, from jail—and himself. Performances will be at 7 PM this Friday and 2 PM Saturday & Sunday*, with more showtimes each weekend through April 28. This play is suitable for all audiences. *The performance on Sunday, April 14 will be ASL-interpreted. From the Studio: Ignite! Community Theatre presents "Bloody Murder"
Director Bryan Durbin and actors Barry Brathovde, Scott Finlayson, Karen Brathovde and Gail Cory-Betz from Ignite! Community Theatre came to the studio this morning and gave us a drop of “Bloody Murder,” their latest production. An Agatha Christie-esque murder-mystery turned farce, it depicts an ensemble of genre-typical British characters as they awaken to the reality of their fictional existence and rebel against the author of their story. Performances will be at 7:30 PM this Friday and Saturday plus a 2 PM matinee on Sunday, with more showtimes each weekend through April 28.